Would you fancy walking on 320 metre tightrope 30 metres above Blenheim Palace’s lake? Well luckily, you don’t have to, but rope walker Christopher Bullzini is taking on the challenge in the upcoming Tracing their Footsteps High-Wire Walk event. We chatted to him ahead of the performance about how he got into rope walking, how he is following in the footsteps of renowned 19 Century performer Carlos Trower and what he sees as the golden age of circus. Culture Calling: How did you get into rope walking? What made you want to be a rope walker? Christopher Bullzini: I’m not one of those kids who always wanted to be in the circus when they were at school. For me, it’s something that I drifted into. I was always a juggler; it was a hobby when I was at school. When I was 19 and my mother passed away, I packed some juggling balls in a rucksack and went off travelling. Whilst I was doing street shows around Europe and further afield, I met a girl who walked on a slack rope. And I was just absolutely besotted, not with her, but with the rope walking itself. I fell in love with the floating aspect, the fact that you’re elevated in space, it just absolutely seduced me. So that’s when I started to learn. She taught me the first couple of steps, and I haven’t really looked back. CC: So you started on a slack rope… do you prefer slack or tight rope walking? CB: I really like all aspects of funambulism (rope walking), however over the last few years I’ve gravitated more and more towards the high wire. I like the simplicity of it, and if I’m completely honest I like to get further away from the people! It’s lovely to have really big audiences, but there’s something really special about being really high up and far away. Saying that I also really enjoy doing little shows – it’s all good. CC: Where else have you performed? CB: All over the world! I’ve performed as far away as Australia, and I’ve done tours of Macedonia, last year I was in Andorra, all around Europe. I’ve done little street shows, and even an impromptu show for a Maharaja in India a couple of years ago. I do a lot of stuff on my own, but I’ve also worked in movies and theatre, with Cirque du Soleil and a company called the Invisible Circus in Bristol. 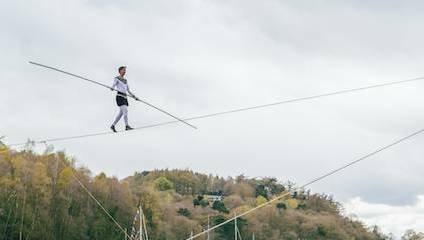 CC: The rope walk you are doing at Blenheim Palace is recreating one performed across the lake by renowned tightrope artist Carlos Trower in 1886. Can you tell us more about why this rope walk is remembered/so special in history? CB: I’m fascinated by all the rope walkers that have gone before me. I see it very much as a tradition. It’s really amazing for how many hundreds and thousands of years people have flocked to watch a tight rope walk. I especially love the era of the mid 19 Century. It was really a golden age of circus and high rope walking. Trower was particularly interesting because he was a black man who believed he was either a freed slave, or that he was related to slaves. So for somebody to go, within a generation, from this horrible existence to be a famous, respected artist is amazing. The walk at Blenheim signifies that more than any of his other feats, because obviously, it was a palace owned by the Duke of Marlborough. So for a Duke to book, as they said back in the day “a person of colour” is really amazing. CB: The world record for the longest one is I think over a mile. The one I’m doing is less than half a mile, but I don’t know of any that are longer in the UK, certainly not in the last 100 years. CC: Have you been practicing a lot in preparation? CB: Always practicing! We’re actually about to do a show in Sunderland in a couple of weeks. That will be really good practice for Blenheim because it’s also over water and it’s a similar height in places. Every rope walk is different, but the preparation has to be a pretty constant thing. We have to keep out bodies in good form. CC: Trower often performed blindfolded and in shackles. Have you ever performed like this? Or what other crazy things have you done? CB: I’m really intrigued to train a lot of the traditional tricks. I do really like some of the contemporary movement and expression which modern day circus performers are experimenting with. However, I have a special place in my heart for the tradition, and things Trower would have done like walking blindfolded and in shackles. You also often see pictures of him wearing a sack, which shows the tricks were often more than just for the challenge, they were to give the audience an image. Especially for Trower with the shackles, it was often very poignant because of his connection to slavery. What a great way to symbolise freedom, to walk a tightrope and face the challenge of the shackles, and to be released when you reach the safety of the platform on the other side. CB: Yeah, I don’t know the full extent of the day, I’m obviously focusing on the wire. It’s definitely enough for one person! But I do know that a historian, a very good friend of mine, Dr. Paul Green, has done a lot of research in Trower’s life, and he’s going to be there to tell his story. This is the thing for us, we want people to come and see the spectacle, but we also very much want people to come and remember Carlos, and to think back with nostalgia to this golden age, and about how it must have been to witness a breathtaking live performance for the first time before we had iPhones and modern day distractions. “Tracing their Footsteps” High-Wire Walk will take place on 11 – 12 August 2018 at Blenheim Palace, Woodstock, Oxfordshire, OX20 1PP. A park and gardens ticket or valid annual pass is required to attend the event.